The landing page of your marketing campaign is critically important to the success or failure. It can be the difference between losing thousands of dollars or generating millions. Landing pages are much more than just a simple design slapped together with a form. A well-made landing page is about combining persuasive content with a pleasing and conversion focused design. First, let’s define what a landing page is. A landing page is a simple one-page site that is designed to convert. It can serve a lot of different purposes but the main one is to generate a conversion. The content of the landing page should be specific and persuasive. It should contain benefit driven copy that compels people to take an action. One of the biggest mistakes that I see when small business owners advertise online is that they send their traffic to a homepage instead of a landing page. A homepage is like a brochure for your business. It should contain general information about your business and who you serve. There are usually links to other parts of the website. When it comes to landing pages, think of it as the resistance your visitors have to complete a task. Our goal is to create elements that make it easy for visitors to take action. Your job if you don’t want to throw money down the drain is to design a landing page that generates inbound phone calls. An inbound phone lead has a 1000% chance of converting compared to other leads. The two main components of a great landing page are a conversion focused design and benefit driven copy. A landing page can contain video or just plain text. It can be low-tech or high-tech. It can be many different colors or just one color. It all depends on what your objectives are. An easy shortcut is to model successful landing pages. There are several marketplaces available that you can use to purchase ready-made template designs. The design should be conversion focused. If you are doing an AdWords campaign the whole goal of the landing page is to generate an inbound phone call. The main objective of the headline should be to clearly state the benefits of your company. It should be relevant to what the prospect is searching for. A well-made landing page should have the same call to action multiple times throughout the landing page. It should use action verbs to get people to act. An image or multiple images conveying the value of your offer should be used. The best images are the drone shots of your work. These images clearly show the expertise of your work. A landing page with an explainer video will increase the conversions on your landing page. Video usually converts better than text. 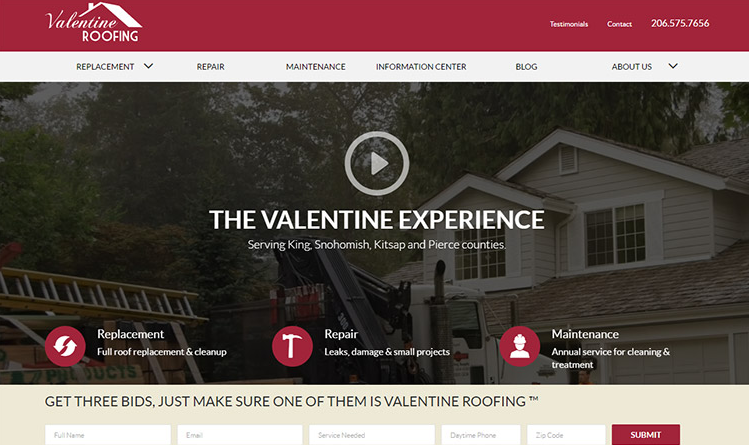 Using images of your roofing associations and certifications will increase the conversions on your site. Video testimonials work better than text testimonials. Using real images of people will add authenticity to your message. The copy on your landing page should clearly explain the benefits of your company. Make it about them and not you. It should provide a clear description of who you are, who you serve, and how they can benefit by working with you. More than just a landing page builder, with Clickfunnels, you can create an entire sales funnel in minutes. It’s the software that I recommend to build landing pages. However, there is a big drawback. Unlike Unbounce, there is no dynamic text replacement option you can use. You have to hire a developer to create this script for you. Having dynamic text replacement is critically important in pay-per-click advertising campaigns. This is a pretty good landing page. It’s a simple and clean design. The only thing I would add is to the phone number on the top right-hand side. Unbounce is another great landing page software that you can use to create conversion focused landing pages. It has a lot of different integrations and is easy to use. You can choose from over 100 different template designs. The one thing that Unbounce has that Clickfunnels doesn’t have is dynamic text replacement. This feature allows you to dynamically change the text on the landing page based on what keywords they are using. What is Dynamic Text Replacement? Having dynamic text replacement is critically important in increasing the conversions of your campaign. If you are paying $40 per click then this feature can save you hundreds or even thousands of dollars by the increasing the conversions. The third software that I recommend that you use is Leadpages. It’s more expensive than Unbounce and Clickfunnels but it works great. One of the best things about LeadPages is LeadLinks. This allows you to generate leads with 1-click sign-ups. If you are doing any type of paid advertising on AdWords or Facebook, having a landing page is a must. There are a lot of different types of landing pages and knowing which one to use for each situation is important. 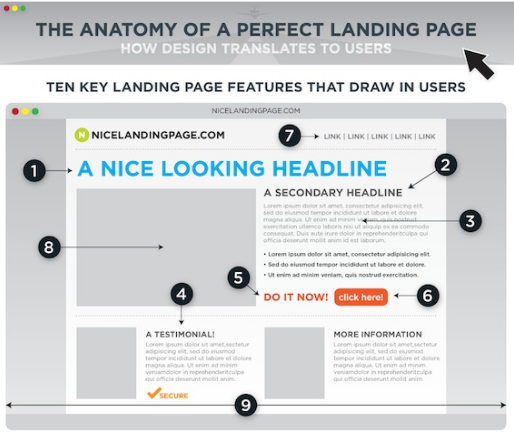 A well-designed landing page has all these 7 elements. If you implement these 7 elements you will decrease your cost per lead, improve your conversion rates, and improve the return on investment. Start-up roofing company in eastern Massachusetts looking for marketing assistance.